SÃO PAULO, BRAZIL – Plans by the Brazilian government for a plebiscite on political reforms in Brazil, originally brought forward by Brazilian President Dilma Rousseff in the wake of recent mass protests across the country, have been thrown into doubt. Vice President Michel Temer said that the government had “given up” on a 2014 plebiscite, but later backtracked on the comments, photo by Wilson Dias/ABr. Some government figures backing the proposal, including Vice President Michel Temer, said there was not enough time to agree on the referendum and get reforms through Congress before the upcoming 2014 presidential elections. Earlier on Thursday, Vice President Michel Temer (PMDB) told reporters that, despite general agreement on the “themes of reform,” the government had “given up” on the plans and was looking toward a 2016 vote instead. 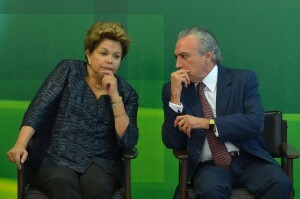 However, Mr. Temer later backtracked on the comments through a statement, saying he had merely expressed “the opinion of a number of [allied] base party leaders in the Chamber [of Deputies]” and concerns over time limits decreed by the Tribunal Superior Eleitoral (Superior Electoral Court, TSE). “I reiterate that the government continues with the position that the plebiscite would, ideally, take place on a date that could alter the political-electoral system before the 2014 elections,” said the vice president, adding that a meeting next week in the Senate would attempt to elaborate on the legal basis surrounding the plebiscite. One of the proposal’s main opponents, PSDB President and Senator Aécio Neves – also President Rousseff’s most likely main opponent in next year’s presidential elections – described the plans for the plebiscite on political reforms as “stillborn”. He accused the government of consulting only with its allies, ignoring parties that “represent half the Brazilian population,” in a thinly-veiled allusion to his own party. Tension has arisen over the preparations for the plebiscite as, in accordance with the Constitution, any changes to the political and electoral system would have to be introduced a full year before the next election it would affect. The plebiscite would also have to be agreed upon seventy days before it could be held, as well as facing subsequent congressional approval – all of which would have to be completed by October 5, 2013. President Rousseff has spoken of her desire to see the reforms in place in time for next year’s elections. Other government figures have voiced concerns that, should the plebiscite take too long to be held, it could anger the already-frustrated populace and reignite mass protests.